Please note that there is also a one page summary of the scenarios available here. We strongly urge readers to at least glance at the paper on demographics and pensions, as its findings have a major bearing on what follows. Equally, the aspirational New Narrative is not described in detail in this section, in part because it still remains a mystery to the entire Western world. However, necessary elements of it are described in the paper which is referenced above. The economic outlook is gloomy. We have do deal with the aftermath of the crash. The industrial world faces an equal or greater drain on the public purse as a result of unfunded pension commitments, involving sums greater than global warfare. As the world population rises towards nine or so billion, and as economic growth continues, as an ever-wider range of raw materials become scarce, the mildest consequence of which is supply side inflation every time growth picks up. Price instability must be a feature of the times. Additionally, environmental issues will not resolve themselves and enormous sums need to be spent. The figure gives a sense of the times at which these forces will impact, in virtually any case. Less unavoidable, but still very much in play if the variables are managed badly, the West has to change its narrative, the story that it tells itself about values and social verities. 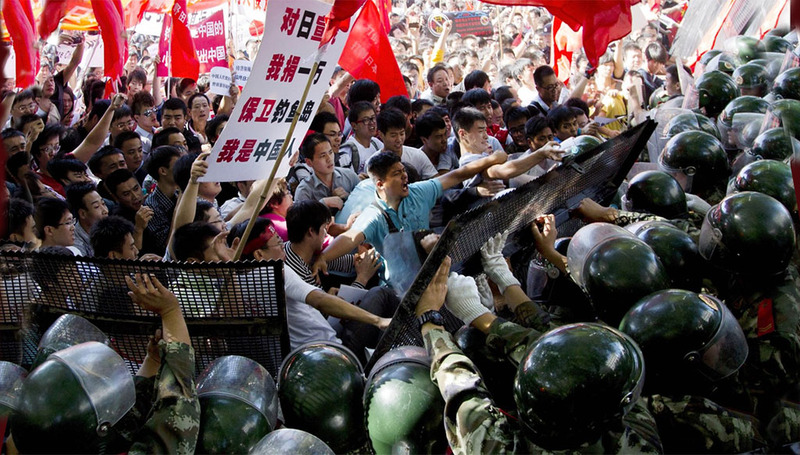 China has an equivalent transition to make, of an even more critical importance to its future. The rest of the world has, in its varied ways, a much clearer narrative – "Get place and wealth, if possible, with grace; /If not, by any means get wealth and place". (Pope- Imitations of Horace) It is the playing out of these variables, against the backdrop of predefined economic constraints that defines the scenarios. 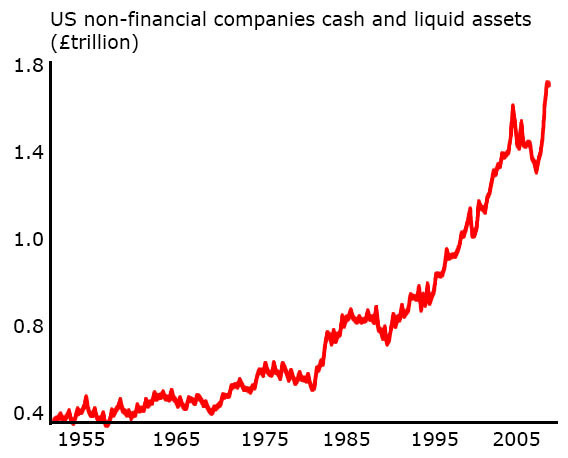 As the figure shows, Western companies sit on mountains of cash, which they are reluctant to invest. "Uncertainty" is an insufficient reason why the warehoused projects and technology of five years cannot be set in train. There are, indeed, core uncertainties: in US politics and state finance, in the various collective and individual crises in Europe, in Japan. Senior executives are seldom able to put their finger on the precise issue. There is a general sense that the world has changed, and done so in ways that invalidate many former unspoken certainties, particularly sociopolitical certainties. There is no shortage of people calling for "new paradigms", usually around environmental issues or questions of what they term social justice. We argue that what has already failed – but what we have yet to notice overtly – is the overall narrative, the structure that held society together for the past century. At its core is what a nation state owes to its inhabitants, how atomistic processes – such as markets – meld with top down systems management and leadership, what duty of care citizens owe each other and how the least able in society are to be supported. That is a big assertion, and it needs to be justified. However, before we expand on it, it may be helpful to note how this fits with the scenarios themselves. If we are able to continue with the current general narrative, we drop into Muddling Through. If we persist with it, but are unable to support it economically, we drop into the disastrous Old Narrative 2.0. If we find a new, apposite way of running our affairs, we develop the New Narrative. The end of the Nineteenth century raised the real issue of for whom it was that a society existed. Might it be an aristocracy of birth or wealth? Should a modern society look to great leaders, executing grand projects with society as the steel on their anvil? Perhaps everything should be subject to the rule of the capitalised People, however led. Germany under Von Bismarck was troubled by Marxist agitation and moderate socialist movements, These were banned, and by way of compensation, the state was to provide old age pensions, industrial accident insurance and universal health care. A bellicose Prussian aristocracy was to care for and manage the German peoples, by its own lights. Plainly, there was a lot more to sort out before a successful model was to emerge. Two world wars and a half century of remarkable social change created a model for a managerial state capitalism, a model that was not unlike a wartime economy. The rights and property of the individual were enshrined, but subjugated to a managerial state. The roles of this new state were divided broadly in three parts. The state was to create the grounds for economic competence through its management of intangibles such as law and the economy. It was to provide physical infrastructure, such as roads, and the skills needed by industry through state education and training. It was to use a proportion of the economic surplus to buy public goods, such as security and public health. As a part of this, it was to support the least capable in society. This model was virtually universal after World War II, variously called the New Deal, the Welfare State, Sozialstaat or Folkhemmet – Peoples' Home. Economic performance within nations is very uneven, but even allowing for laggard hinterlands, the clear truth is that the national core grows or fails as an entity. Economic progress will usually create the conditions for its own future success. The absence of economic progress guarantees that the only way for any one group to get wealthy is for it to impoverish another group. The great achievement of the West in this regard has been a sociopolitical style, one that sets out to understand how things work – institutional things, technological things, human things – and to improve these piecemeal. "Improvement" refers to a compromise between social tranquillity, economic dynamism, collaboration wherever possible and decisive force where not. Market mechanisms do some of this well, but they fail utterly when challenged in other areas. Individual agents such as firms and rich individuals are not motivated to educate the broad population or preserve more than their personal environment, and are anyway individually poorly suited to do this as individuals. The state has had to pick up all of these roles and a host of others, Its management of them is intended to improve national economic performance and the general quality of life, such that as few as possible suffer extreme deprivation, and as many as possible enjoy as wide a range of options as is feasible. Competition, economic or not, is innately divisive: losers, after all, lose, and winners start on new competition from a position of advantage. Unequal societies, if left to social Darwinism, rapidly become less equal. The state has universally set itself against this, generally with increasing success as the societies become richer. Social inequality tends to peak at around US$5000 per capita, when individual agents are still largely unrestrained by the state, but where there are considerable spoils to accumulate. 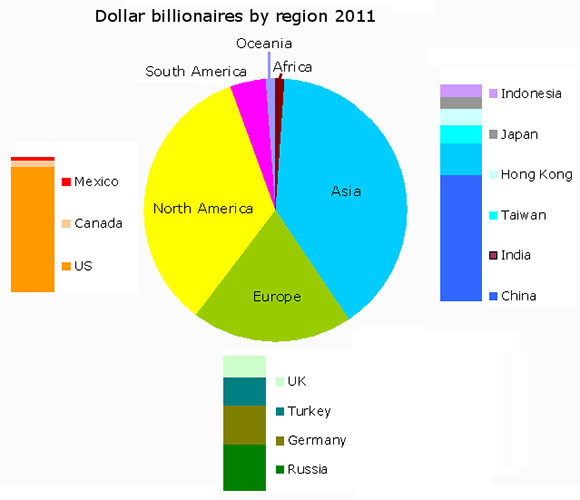 A third of the world's billionaires live in China, Russia and India. Buying social peace, a topic addressed in detail elsewhere. Ensuring tolerance of economically advantageous policies that are otherwise divisive - free trade, fast productivity growth etcetera. Ethical or frank political goals, from vote-catching to covert class warfare. The upshot of these processes, allowed to run for several generations, is that a few tens of percent of any industrial nation support the remainder, when considered in terms of overall tax contributions and overall welfare received. The top 1% of earners in the US pay 37% of tax income, the top half – which receives substantial state subsidies – pays 99% of all relevant tax. This proportion has gradually changed, so that a smaller and small fraction support the remainder. However, due to international competition and particularly to the impact of the new global workforce on the low skilled in the rich world, income differentials have also increased. The decline of organised labour consequent on weakening mass manufacture in the rich world has also contributed to this. This situation - of massive transfers, of a paternal state now mediating between commerce and its high skill workers and the remainder of society, of declining or static median and low wages - has developed gradually, and became a part of everyday life. It became the social narrative of the West, the way that things were done. The system became increasingly untenable in the 1990s. This was due to several different factors, from commercial practice and the integration of IT into quality controlled systems, to the near-doubling of the world workforce and, above all, by the rise of China. The consequent increasing inequalities were papered over by greater transfers, by state deficits - often driven by tax cuts - and by state complaisance about debt. Individuals, companies and states piled up tottering piles of debt. House price and asset inflation allowed individuals to extract income from their debt, worsening the situation. 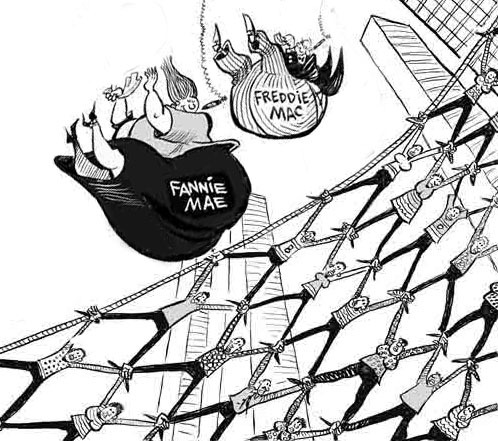 One particularly pernicious form of welfare occurred in the US, mediated by the housing corporations, Fannie Mae and Freddie Mac. These were ordered to extend mortgages to low income people. This order, coupled to mismanagement, drove the sub-prime crisis ten years later, where they were found to have lost $1.1 trillion. Banks had meanwhile shuffled this debt throughout the world financial system. When Fannie and Freddie failed, the banks froze and the overall state of indebtedness gradually became revealed. Equally, and more slowly, a series of state bankruptcies appeared in Europe, once again affecting banks. States have now committed future revenue on a truly vast scale to attempts to re-stimulate the economy, capitalise defective banks and prop up trading partners with loans. It is clear that something deep has changed. 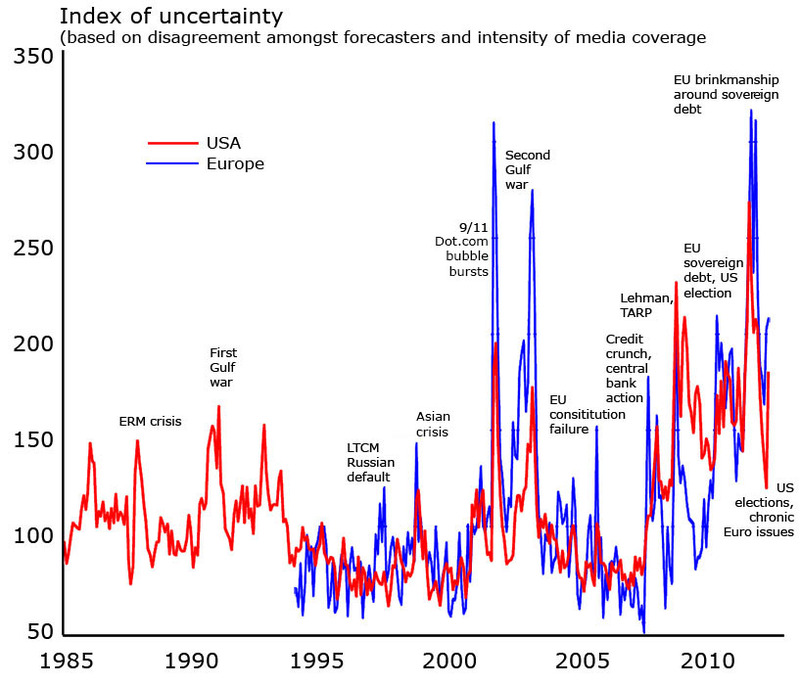 Commentators who evaluate uncertainty dwell on short run US funding issues, or the Eurozone crises. Both of these are important, but not so as to explain the deep reluctance of firms to act. Nobody can truly see a return to the pre-bubble status quo, to the Old Narrative of how Western polities should operate, but nobody has suggested a new one. We refer to this new dispensation as the New Narrative. Welfare has reached a limit beyond which it cannot easily pass. States are everywhere retrenching it, recognising that the surplus that had been dedicated to these charitable purposes is no longer there. Looming ahead of us, the Western nations face demographic change and a state pensions deficit so vast that its current estimated shortfall matches the proportional cost of World War II to its combatants. This effects nations in different ways, and many current partners will have little in common fifteen years from now. IN addition, competition will be far harsher in the 2020s than it is today, and regulation probably more burdensome. This is the environment which decision-makers sense and away from which they tend to shy. This is not to say that many affected nations will not try to press ahead with further extensions of welfare. The consequences of doing this are grave, as they involve trade protectionism, xenophobia and very high taxation. We call this political syndrome the Old Narrative 2.0, a new and punitive issue of the New Deal. The industrialising nations have clear imperatives on them. China is, however, distinct. It has intense demographic change with which to cope - demanding welfare reforms, or indeed, creation - and it has to find more inclusive forms of political engagement. It has decided to shift its economy from export orientation to internal consumption, which in turn involves boosting wages. This will happen anyway, due to skill shortages, but China's firms have a reckoning to make with their workers, who currently closely match Marx's specification for an industrial proletariat. Corruption is rife, commercial interests ride over local interests with the connivance of local government - issues such as pollution, land grabs, dangerous conditions, low pay - and a considerable head of steam has developed. If world conditions favour China's plans, it may well succeed, slowing from its recent extraordinary growth. There exists a real possibility, however, that in a low growth world they will drop the ball, experience mass labour activism and suffer a major slow down. The impact of this on its neighbours an on the industrial world will be considerable. Specifically, due to the repatriation of jobs and the rhetoric of labour triumphalism elsewhere in the world, the Old Narrative may be able to continue for a while, before it hits the state pensions ceiling. Consider a world of innately low growth. The business-as-usual case that this supports is called Muddling Through. It is able to keep the Old Narrative running for another decade or so due to Asian difficulties, or the sort just discussed. However, those difficulties also guarantee slow world growth. Nations which embark on Muddling Through but which are not supported by Asian failure, or which press too hard,elect populist politicians with a narrow time horizon or which simply make major mistakes fall into the case we have called Old Narrative 2.0 - described above, clamping down on trade, subsidising jobs, taxing heavily, destroying the seeds of the future. Some nations will, without doubt, fall into this category. If many do so - for example, a Eurozone that persists against all reason - or if there are major economic accidents in the world at large - then the world moves into a deeply dangerous situation, in many ways similar to the 1930s. Consider, by contrast, a world of inherently better growth. As indicated, this will immediately trigger supply side problems. One must never forget that world population is heading for 9 billion at close to the end of the scenario problem, with vast infrastructural needs. Hydrocarbons will come from an increasingly narrow geographical focus - fracking aside - and the uncertainties of climate change will be much more narrow. A world that has put the uncertainties of Europe behind it, which has the US and China managing their affairs smoothly, will therefore face a range of supply side issues. The pressure to operate with extreme efficiency will be there. The pause in industrial world growth means that international competition will hit national "high end" industries perhaps a decade sooner that would otherwise have been the case. Competitive positioning on a national scale will be universal, with every agency and activity benchmarking itself against international best practice. The figure puts these cases in context. (A more dynamic variant of this is available in the main text.) The red star marks the present, at the limits of the tenable. The blue arrow symbolises the need for fair winds for the industrial world to make its transition to New Narrative, or - in a very different way - to Muddling Through. Harsh conditions strongly predict a world with a major element of Old Narrative 2.0 to it. The New Narrative offers the rest of the world a new set of aspirations and goals. Although the industrial world faces major issues of debt resolution and demographics, these nations also feel a confidence previously lacking. Welfare concentrates on areas of real need - chiefly ageing - and societies invest to avoid the need for welfare. The issue does not go away, but there is some hope of its resolution. In both Muddling Through and Old Narrative 2.0, however, the West is seen to have lost its way, in a terminal fashion. Its views no longer count for as much in the rest of the world. 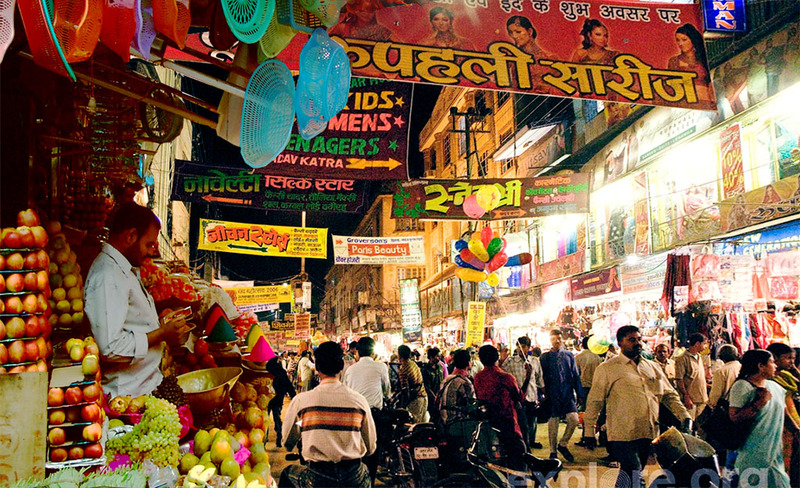 The emerging markets will deliver around 3 billion middle class citizens by 2025. These will not be looking to a Western paradigm. Their own notions of a fine society involve their own political and economic dominance of it. In many ways, their world will feel like the Europe that existed before 1914, without an aristocracy, perhaps, but certainly with a plutocracy. They will be little interested in environmental issues save as these impact directly upon them. Their reflexes towards political participation will be those of managing the electorate, rather than responding to it. They will be intensely concerned by crime and disorder, and will not believe that the poor nations can easily join the club that they have built up, save on their own terms. The influence of the rich world will still be there - through military strength through economic weight - but its moral imperative will be lost. The period around 2025 will be characterised by increasing scarcity - in reality or in prospect - of many resources, from land and water to minerals and energy. The scramble for this under Old Narrative 2.0 will at times be violent and always beggar-my-neighbour in its approach. Clientism, spheres of influence and all of the elements of the Cold war will reappear. The Muddling Through scenario will be more genteel, and some useful international mechanisms will appear, from financial markets to regulation to avoid supply shocks. 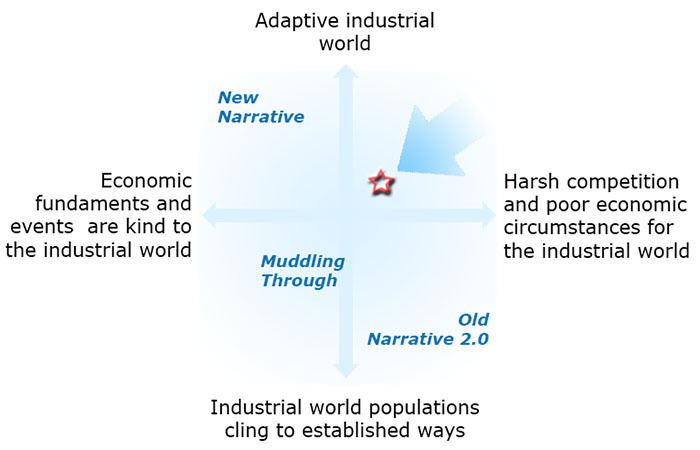 The New Narrative world is focused on managing systems in their own terms. It will proliferate international that are institutions designed for purpose and not politics. The scenarios are not "global", in the sense that everyone lives in one or the other of the three. It is entirely possible for a club of nations to engage in New Narrative approaches, with others Muddling Through. It is inevitable that some parts of the world will find themselves in something like the Old Narrative whist others get on with reform. However, these " ways of seeing yourself" will deliver results, and other nations will quickly be drawn into the orbit of one or the other of them. That is the nature of a national social narrative: it crushes other interpretations, insisting that it alone is correct and propagating only views that reinforce it. We are going to suggest that the current distributive model of social organisation – specifically, welfare – has reached and gone beyond its limits. As these notions are something of the core on which the assumptions of the industrial world population rest, this is deeply important. We strongly suggest that readers consult the papers on Understanding Narrative and Demographics and Pensions before beginning. We have noted that although banks were responsible for the propagation of the financial crisis, they were not the root cause of it. This came from excessive state and consumer debt, The US$1,2 trillion insolvency of US semi-public housing corporations Freddie Mac and Fannie Mae were the triggering event, and European state deficits have been the cause of the crisis continuing. These had been ordered by the state to extend mortgages to low income individuals as an act of public welfare, and through mismanagement and darker forces, the issue ran out of control. Banks, accepting these seemingly blue chip "assets" then circulated them in occult form, and multiplied liabilities on top of them in ways which create liability. Private consumer debt also reached extraordinary proportions on the back of both state deficit spending and house price inflation. State funding comes from a narrow base. Something around two third to four fifths of the population of industrial world citizens receive net transfers during their lives, through a mixture of direct payments and free services. It is politically advantageous to extend this, as it attracts votes. There has been a particular drive to support low skill people during the last thirty-odd years, as competition from low income, high skill countries erodes their earning base, and as the traditional family structure that offered mutual support in adversity becomes weaker for these groups. Welfare is now by far the largest element of state spending in the industrial world. Well-intentioned extensions to welfare were the chief causes of the financial crisis, as discussed above. State debt is now unprecedented as a proportion of GDP, and the tax base is probably at the limits of exploitation. This situation would be tractable over the medium term if it were not for a further problem that is on the immediate horizon: demographics and their grey handmaids, pensions, adult care and health support. Unfunded pensions in the US amount to about $4 trillion. To put that sum in context, US spending on World War II was around $4 trillion in today's money, according to the Congressional Research Service. European state pension shortfalls are around €30 trillion, with Germany accounting for €7.6 trillion and France €6.7 trillion. The overall operational costs of World War II to all combatants were about $19 trillion. These costs ignore the other two handmaids – health care and adult support, both of which will become more costly as technologies develop and aspirations expand. In other words, the welfare bandwagon will either come to an abrupt stop, or continue to roll at the expense of general competitiveness. This is the issue on which the future of the industrial societies now rests. It is, therefore, important to consider the origins of the modern "social contract". Societies have a hidden set of assumptions and implied rules, which is normally called the "narrative" – see the paper here for more. What these are at present, and how they may behaved when shocked in this way, is something that we need to explore in their historical context. Please be prepared to meet the Iron Triangle. Our modern concept of employment dates to around 1880. It has been dying since about 1980, along with the industrial model that brought it into being. This is the model based on the next-to closed nation state, carrying out all aspects of the supply chain, enjoying the more-or-less sole consumption of its output and dependent for demand on aggregate local wages. Until industry required skills, almost all industrial work was ephemeral. (Public sector work, by contrast, lasted for a lifetime.) As industry required skill - and usually collective skill, the team rather than the individual, so continuity of employment became the norm. Even then, large-team activities were the exception rather than the norm. It is worth recalling that even in 1900, only a small fraction of people worked in enterprises with more than ten employees. 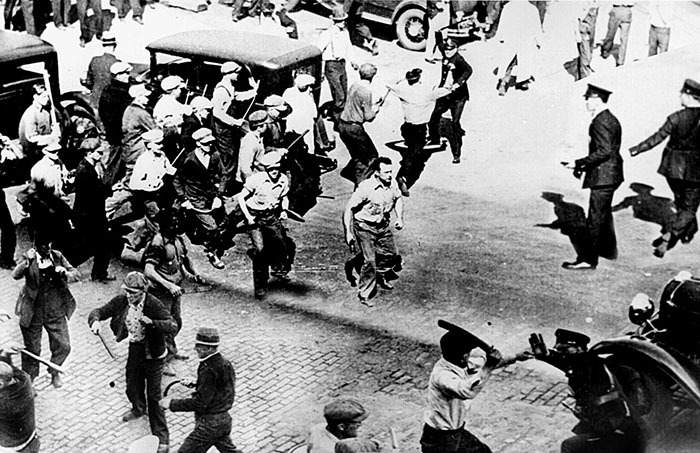 World War I and Henry Ford between them generated the world of mass employment, mass unionisation and formal antagonism between worker and employer. Political institutions therefore adapted themselves both by sweeping regulation of the conditions of employment and generic support of unionisation. The result has been called the Iron Triangle: a balance of power between major industry and its shareholders, the state in general and politicians in particular and unionised labour. The narrative that resulted from the Iron Triangle revolved around the distribution of the then-unquestioned dominance of Western economies. In the US, the power of business was greater, but so was its supremacy in economic weight. US state spending tended to be both massive in absolute size but less focused on social issues than was the case in Europe, notably after the injuries of two major conflicts. The Big State in the US invested heavily in public goods - notably around the Cold War - whilst Europe was more concerned to cosset its population. The model on both sides of the Atlantic assumed that most people would work in large, regulated enterprises that could be compelled or induced to provide them with non-wage benefits such as pensions and health insurance. Industry was content to absorb these because first, it competed only with its national peers, and they had to bear the same costs. Ultimately, all such obligations were taxes on the consumer, of course. Second, these were deferred costs that did not impinge on the tenure of current management. As we have since seen, of course, this 'kick the can down the road' approach has now led to the bankruptcy of companies such as GM, and immense burdens on many other companies that they do not truly know how to handle. World trade grew faster than GNP for most of the last century, and it was inevitable that more and more of commerce would be increasingly exposed to the cost profiles of other nations. The emergence of Japan as a vehicle exporter had a cataclysmic effect on all but German car manufacturers, for example. However, the world workforce nearly doubled as an educated generation coupled to the effects of political change in Asia. Equally, hard technologies such as communications and ship-building met softer skills, such as quality control and supply chain integration to change utterly the closed world of the Iron Triangle. Commerce (and consumers) were no longer bound into the framework that had dominated their world view since World War I. Both could look to high quality, inexpensive supply, and both prospered through this. However, the intensity of the competition - and the global nature of design and innovation, meant that any firm that did not conform to these new rules was swiftly doomed. The impact has been most strongly felt at the level of the lowest skills. Already affected by automation and process redesign, workers had to become more productive. There were two routes to higher labour productivity: to increase the effectiveness of the structures that supported the individual worker, or to lower wages in real terms. Where neither prescription has been possible, the industry in question has simply ceased to exist. For example, prior to its eventual extinction, the British coal industry was producing 120 million tonnes per annum, only 10 million of which could compete with the delivered cost of coal from Australia and Colombia. The removal of post-war structures in which power generation and coal production were intimately tied together as a national asset allowed power to be sold at less than half the previous price. The higher prices had been a covert subsidy to an accommodation by the Iron Triangle to keep labour occupied and to maintain the status quo. There are good ways and bad ways of running an Iron Triangle. Attempts to head off social change and political difficulties almost always led to inefficiencies. The British coal and US car industries are examples already noted; but the list can be expanded almost indefinitely in Europe, from farm subsidies to iron and coal "agreements". By contrast, the German approach to the 'social economy' scored some successes. Engineering in Germans, and particularly car manufacture adapted by raising individual productivity, through a mixture of education, training and embedding in excellent systems of production. It also scored failures: the Green movement effectively destroyed German pharmaceutical leadership, and is currently set on wrecking its energy infrastructure. Global dynamics are such that a nation that wants to enjoy the benefits of trade has to adjust to these forces, forces which will continue both to intensify and to move up the level of skill that must meet international benchmarks. Nations can maintain their Iron Triangle if they reject these benefits: that is, if they shut their borders and protect their home industries. Later, we shall meet this attitude as the Old Narrative 2.0. High cost producers in open economies are doomed. Closed economies are also doomed, but it is a collective disaster that those who prefer current social peace will perhaps prefer to kick down the road to a subsequent political generation. None of this is new. Low skill wages have been falling in real terms since the 1970s in many countries. Middle incomes have been static. A number of factors allowed this to be concealed during the run up to the crisis. The state employed more, many of them of low skills. States increased welfare payments and benefits in kind, such that this became a dominant element in their budgets. They also reduced the taxation burden, thereby running deficits that have, of course, now come to set limits on any future expectations of welfare. Private debt was also allowed to soar to unprecedented levels, and regulation permitted far easier access to credit. House price inflation was both an outcome of this, and a driver to many to borrow yet more. Savings fell to record lows: in part, due to state guarantees about retirement, in part due to very low real interest rates; which of course also encouraged debt. All of this camouflage kept the real situation off the political table and allowed the Iron Triangle to continue in spirit, even as the element of organised labour faded away. Later, we shall call this the Old Narrative, the model of statism that succeeded the Iron Triangle, and which has dominated political debate for the past thirty years. Its core notion is that of the state as proxy parent, providing an ever-more ambitious backdrop to everyday life, through every epoch of life, intensely normative, more than somewhat controlling and, with all of the best intentions, invasive and pervasive. There have been major national differences in how this is achieved, and the degree to which it achieved. Nevertheless, the general ambition has been that from birth, citizens are to be shaped to fit in with a society that is civilised, open and in every way healthy. The consequent expansion of longevity and ability, participation and economic capability has been startling, and this program has almost everywhere achieved all of its early ambitions. That does not, of course, mean that it does not have even more extensive ambitions for the future; or that these achievements have not come at a cost. In order to finance process, money has been raised and redistributed on a very grand scale. Net transfers from high earners and corporations to the rest of society mean that throughout their life span, average Americans who were born in 1945 will have received net transfers from the state of around $2.2m, expressed in current money. Less than a third of Americans pay net tax, and a similar figure is true of European countries with modestly progressive tax systems, such as Britain: that is, two thirds get back more than they contribute. More progressive taxation in, for example, Germany imply a still smaller number make a net contribution. The figure shows welfare benefits as a percent of disposable income for OECD European countries, by decile. The panel on the right shows how, until recent reforms, the marginal tax rate varied by someone on a low income who had the opportunity to work. The maze of entitlements mean that their marginal rate of tax leaps up and down, providing an intense disincentive to work more. The accumulated US entitlements of the aging population mean that the next generation will have to find $0.4 trillion in more tax over an average life span. Large-scale borrowing by the state, a phenomenon that started with the Reagan tax cutting era, is no longer viable. US state debt is now at a level where it impinges directly on growth, as it is virtually everywhere else in the industrial world. The IMF note that balancing the US state books, without tax increases, would require a seventy percent net in net transfers, or proportional cuts between the two. Plainly, a watershed has been crossed. In 2012, the Joseph Rowntree Foundation working with the UK Commission for Employment and Skills, considered British work and remuneration in 2020. They looked at changing regional and sector balances, sector profitability and alterations in skills, gender participation and other demographic factors. Their unequivocal finding was that "analysis indicates that projected changes in employment structure between now and 2020 will result in greater income inequality and higher relative poverty rates." Twenty policy variants were unable to reverse these trends. These are recipes for unhappy politics. The figure is derived from a comprehensive survey, taken in 2012 of former alumni of the Harvard Business School. Many of these are senior figures in US industry, but a significant proportion are now managers elsewhere, so this is a broad perspective on US prospects. As is evident, only 12% though that US business would be able to extend its pay and benefits, and only a quarter thought that these could be maintained as they are. Two thirds saw remuneration coming down. Some of these figures perhaps represent what these manager think should happen, rather than what will, but the table is, nonetheless, a revealing survey of views on the Old Narrative of today's corporate America. 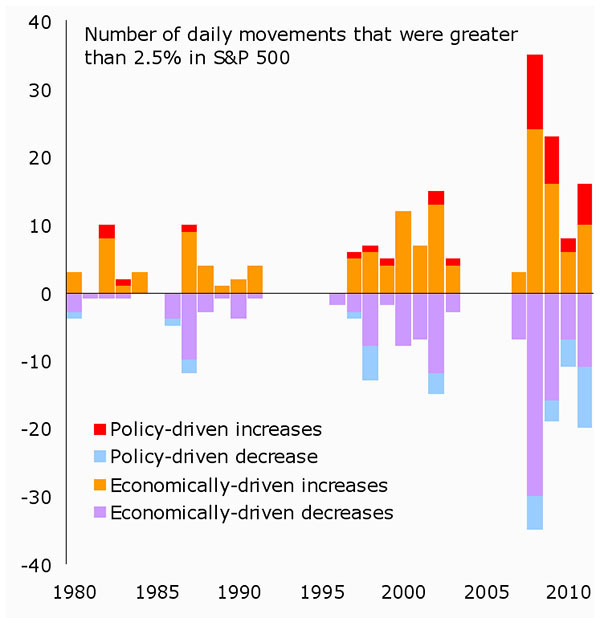 The 2008 crisis has had two immediate and one long-run effect. First, the remnants of the Iron Triangle have enjoyed a renaissance of statism, in that government has to "fix" something that was apparently broken by the private sector. The organised labour element dropped out of the Triangle, and there is now a bipolar structure, with the state in the middle, mediating between commerce and society. The US state tends to see society as an engineering problem, with commerce as a side issue until it does something badly wrong. Since the crisis, "the economy" in the US tends to be thought of in macro-economic terms, rather than as a the sum of many small endeavours. The solutions that have been pursued are all intensely statist. By contrast, the European establishment have been strongly effected by the failure of one of their cherished statist projects. At the same time, the statist administration has been given enormous prominence, in that the world waits for them to do grand, statists things by way of a solution. The entire rhetoric is about how the state can "get the economy moving again", implying that the economy is a sub-set of the state, as was the myth in the heady days of statism after WWII. Second - and in direct contradiction to the first point - it is immediately clear that there is no viable path back to the post-war narrative, to the New Deal and the Iron Triangle. Politicians find this extremely difficult to internalise, not least as it requires them to say things that much of the electorate will find offensive and, frankly, terrifying. However, the only alternatives to avoiding this issue is to respond by stealth or by protectionism, and thence a swift economic death. Most politicians – and certainly virtually al of the media – point to banks as the key players in the 2008 crisis. Certainly, banks created the systemic nature of the crisis through the use of "slice and dice" risk management instruments. Nevertheless, the immediate cause of the crisis was the US housing crisis that was driven, as we have seen, by US government order to the Freddie Mac/ Fannie Mae duo to extend mortgages to US poor. For no doubt all the best motives, this attempt at welfare brought down the system. The crash exposed not-dissimilar indirect welfare planted all over Europe, this being the key dimension of all sovereign debt issues except in Spain, where the housing boom itself had an element of state-sponsored welfare. The allegedly benign neglect of the Caja banks had a "social purpose". Third - the long run effect, is that the currently-rich nations will be swiftly differentiated by the responses that they make to this. Demographic change implies enormous and unavoidable welfare burdens. (Please see this supporting paper on the exposure of states and others to unfunded pension liabilities. That paper ignores the direct costs of an aging population.) All other direct and indirect welfare will have to undergo extensive pruning, with consumers paying for health, education and other services directly rather than through taxation. Saving - that is, insurance - will be forced up. Consumption will, in broad terms, be forced down unless production costs fall as fast. The implication is a further increase in inequality and the consequences of that. Nations which grasp a positive narrative - learn, save, adjust - will be at a clear advantage; but these will be solemn, dedicated nations and not centres of hedonism. The revolution in world affairs will not abate, short of a major incident. Educated workers will continue to arrive on the scene. States will reconfigure their laws so as to enter the global market place with greatest efficiency. Poverty will fall as a result. A global middle class will emerge - indeed, is emerging. Its ethos is happy with inequality, with a state that concerns itself less with social issues and infrastructure, security, financial stability and pollution management. There will be three billion who think like this in 2025, versus one billion or so living in the industrial world. Global politics will, therefore, be dominated either by this view of by a protectionist-social concern narrative. The industrial world need to rethink its fundamentals, but its political system largely stands in the way of doing this. The popular debate remains how the former situation can be restored, and sees the consequences of the underlying forces as symptoms of social rot: inequality, the failure of mass manufacture and the like. Even in the absence of a re-think of the narrative, however, the economic system is paralysed by uncertainty; and below this, a lack of trust in the institutions. Only a few percent of the population report confidence in political or commercial leadership, for example, in journalism and in the institutions of the state, such as police and the law. Those are symptoms of the greater malaise. However, commerce is affected by a lack of trust in far more egregious, statist elements. The greatest of these is the European experiment. This is not the place to rehearse the issues in Europe. We have met many of them already – states that for one reason or another have propped up their Iron Triangles through deficit spending, and states which allowed excessive borrowing, or both at the same time. The inability of the European establishment to provide even a convincing description of the problem, let alone an exit from it, is an overwhelming cause of low business confidence. Indeed, the horrors of a failure of the Euro have been so overplayed that the fear that this may happen is a significant element in this lack of confidence. The paper on Europe as a set of values describes the statist origins and development of the European project in general and the single currency in particular. This was something done 'to' European electorates and emphatically not by them. The rescue of the Euro implies that countries like Portugal or Greece can be brought into productivity parity with Germany in meaningful time, and that the effects of Spanish and Italian self-indulgence can be rescued with limited intervention by the richer nations. In other words, the hope is that all that is needed are some loans, to be repaid in a few years, and everything will be fine. Meanwhile, the citizens of the wealthy countries are not to be consulted as to whether they prefer this or other options. The lack of realism of this is plainly evident to any business economist who looks at this issue, They see a problem that is getting worse, and they hear announcements from those who apparently know, that dreadful things will happen if the Euro is not saved. As few have been privileged to see these data, a diffuse worry is set up: understanding that current efforts are not going to deliver, but that a lack of delivery has the potential for disaster. How fragile is the environment into which this disaster – or another, such as Sino-Japanese conflict, or a crisis in the Arab gulf – might occur? Our analyses of the financial system say that there are two separate kinds of issue: defaults and bubbles. The potential for defaults is plainly huge. The likelihood of a bubble anytime within the scenario period is at its greatest, modest, although the system is, if anything, over-regulated around minutiae but still as prone as ever to bubbles at the macro-level. On the supply side, the number of sovereigns whose debt is considered safe has fallen, which could remove some $9 trillion from the supply of safe assets by 2016, or some 16% of the projected total. Private sector production of safe assets has also declined as poor securitisation in the US has tainted these securities. [...] Attention [is now] focused on safe assets' capacity to meet new prudential requirements. [...] The shrinking set of assets perceived as safe [...] will increase the price of safety and compel investors to move down the safety scale as they scramble to obtain safe assets. [This] could lead to more short term volatility, herding behaviour and runs on sovereign debt. In other words, in a world in which things become even less stable, the anti-bubble regulatory requirements will drive the system in search of scarce safe assets, forcing up their price and creating instability. This will occur in even a moderately-stressed world. This is all very gloomy. Even if Europe were to find a convincing strategy to avert crisis, confidence would be undermined by other innate factors. In addition, global supply and demand patterns strongly suggest that fast growth would lead to sharp supply side inflation around primary production- notably, minerals and energy – which would have a depressing effect on growth. To think in this way may, however, be to miss the many forces that point to global growth. Science and technology have been quietly expanding their potential, notably in biology, new materials and energy systems. World communication networks have undergone exponential if evolutionary change, and local structures are developing into ubiquitous, extremely fast, cheap and ubiquitous structures. The supporting software - context aware systems – is developing fast. Information will soon be pushed rather than pulled – that is, users will be informed of what they need to know, rather than what they choose to ask. Most organisations will tell you that they have a decade of warehoused projects. Commerce is sitting on very large cash reserves. The cost of capital is extremely low in real terms. World demand - and the global work force - continue to expand. The quality of the systems that deliver the benefits of globalization have developed very considerably, not least due to the cost pressures due to the recession. Given the right environment, therefore, we could in fact see fast growth, particularly if the work that has been done on minimal solutions and low input manufacturing are properly realised. The difference between these two states is, in essence, one of trust in institutions, and in particular in political institutions. These are not just the host nation's systems, but those of other world players: Europe, Japan or China can individually or collectively affect the US; as is true in almost all combinations of that and a much wider network. What is it that any one of these agents has to show in order to instil confidence? They need to have a credible narrative, in the sense that we have used this term. As we have seen, the previous narrative is defunct, but still walks as animated by statist interventions in the financial crisis. That is not to say that the state is no longer needed, but that the assumptions under which it operated for the past fifty years need a thorough reconsideration. Failure to do so more or less dooms a nation or group of nations to a protectionist future. A central issue is how to harness citizens of low innate ability to productive ends. As with all narratives, this has to be a diagnosis that has been accepted by the society as a whole, is the basis for political debate and which has been subject to robust challenge. It is not an elite 'understanding', something to be done over the heads of the citizens. Countries which are to instil confidence need their narrative, but they also need a credible set of policies that constitute a solution to the issues which the narrative poses. Europe has to be 'about' more than a set of negatives – no war – or abstracts – The European heritage, a voice in the world – and offer its members collective solutions to shared problems that they cannot solve for themselves. The US has to decide on how to be a superpower in an age of connectivity; and what to do with its less able people. In order to get to this position, political debate has to somehow overcome the inertia that is party politics. Parties are now career structures for politicians, conveniences for journalists and a shorthand for the electorate. When polarities were simple – religious factions, social classes – then bundling the electorate into two blocks had some representative sense to it. That simply cannot be true of a modern electorate, save for the extreme elements in it. Our papers on the blocks – Liberal, Libertarian, Conservative and Dispossessed – shows how weakly a two party system can hope to manage this. Modern elections are broadly mechanisms for churning the executive, replacing one group with another. Much in government is preordained by inertia, circumstance, resources and natural limits. For example, the Hollande government in France has been forced to reverse virtually every promise large and small that it made in its campaign within months of taking office. Incompetence can generate distractions and make mistakes, but competence is bound into routine, and usually locked into a statist set of assumptions about the role and nature of the state. Our analysis of government notes the importance of process. Open outcry democracy cannot work, as ten minutes reading Internet discussion groups tells us. At the same time, those good at process – and indeed, good at getting elected – are not generally good at policy ideas generation. They are so familiar with the machinery that radicalism escapes them, or so bound by the electoral rule of offending no interest that is not already overwhelmingly against them, that radical thought evades them. Indeed, concepts that alienate the floating voter is precisely what a politicians cannot stand. Concepts that will motivate the opposition to passion are equally untouchable. This text offers no prescriptions, but point to the faintness of the hope that political powers will be able to deliver on the two requirements that are listed above. However. However, the strength of debate that occurs through new media has developed to a quite remarkable extend. Thousands of minds now meet regularly in order to debate issues on which the have particular competence, or a particular interest. Technical subjects, from health care to garbage incineration, have their supervisory bodies, benchmarking clubs and Internet forums that process insight as much as data. That said, data are collected on recondite subjects and in huge masses, and processed as never before: best guesses are that every OECD citizen has about one gigabyte of personal information on file, of course distributed between banks and supermarkets, the state and social networks. 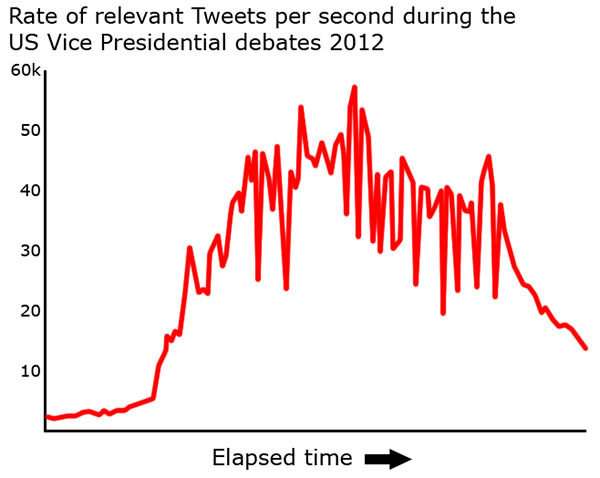 The figure shows minute-by- minute logging of relevant Twitter traffic during the Vice-Presidential debates in the US in 2012. This single show generated 3.5 million Tweets, probably the greatest density of political interchange in history. Expert exchange often occurs on an explicitly international level. Economic debate is now entirely international in scope, in that there is no "Norwegian" economic narrative that differs from everyone else. Professionals acquire jobs internationally, carrying with them skills, anecdotes, networks of informed people. Cost cutting and efficiency drives have all served give the benchmarking of best practice its impetus. Consolidation around quality systems, the requirements of IT and other standardising forces have added to this. All of this – and in particular, the pursuit of best practice - set the agenda within which politicians have to work. It is clinicians and not ministers who set health standards. If something contentious is said by a politicians, a dozen experts will rise to set him or her right. The range of policy choice which is open to politicians on economic subjects, for example, is very narrow, modelled by third parties, subject to critique and, whilst we tend to hear more about the controversies than the centre of weight of opinion, their hands are very firmly guided by this knowledge and the fire that it can call down from markets. This is a quiet process, but it proceeds very rapidly; consider Wikipedia as it was a decade ago, and as it is now. Consider the sources of news and opinion that you use now, and used a decade ago. It is, however, also a piecemeal process. It does not raise the major issues such as the broken Iron Triangle, and what is to be done about it. The dynamic that controls the emerging economies is remarkably similar. After a history of poor government and instability each has found its way to inclusive economic growth. Some have based their development on mineral extraction and farming – Brazil being a prime example - but most have complex economies that revolved around export-focused manufacturing, and growing internal demand that is, for the most part, served with simple products and services. All of these countries need to fold fast social evolution into the space of a few decades. In a single life time, many of their inhabitants will go from rural subsidence to relative urban affluence, to the need to manage a range of novel uncertainties and to a considerable loss of personal autonomy. Mass communities present novel challenges. Transactions that were once almost invariably based on personal reputation an overall trust in the community must now be formalised in the anonymity of city life. Corrupt officials exist as much in rural poverty as they do in cities, but they now lie at the end of every trail, every enquiry. Access to informal networks that bypass or control these blocks is very important. 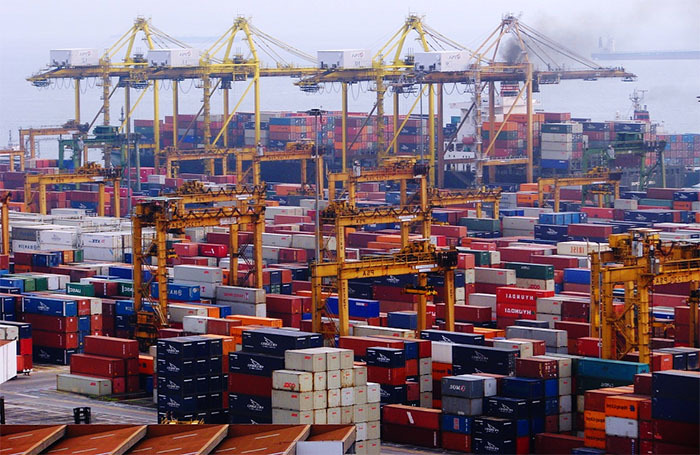 Reciprocity within these networks drives much of commerce and permeates the state. National leadership used to be a remote, vague concept; but political power now impacts directly on every life. Education is seen to open doors, and families strive to get their children into schools that will give them both contacts and meaningful qualifications. The middle classes that emerge from this process are not inclined to trust in political generalities. Their greatest strength is the network that they have acquired, and they favour members of their immediate network – and the more diffuse web of contacts that this provides – when there is any competition for resources. In many ways, these networks recreate the village trust networks. The middle classes have respect for those who can help or harm them, and no empathy for the mass of people who remain unable much to control their won lives. The elite live lives that reflect international taste, supported by a middle class supporter base and a diffuse haze of lower class dependents. They operate with effective impunity, but are generally careful to avoid scandalous behaviour in public. As already mentioned, several billion of these people will make up a major component of the consumer base of the world of 2025. Their attitudes are pragmatic, focused on short – or at best, medium term – betterment for their immediate group. They usually are publicly patriotic, religiously orthodox and socially conformist, but commercially opportunistic and extremely aware of the fountains and flows of power. The most important nation in this group is, of course, China. We have reviewed its prospects and goals in a series of well-informed papers and comments. In brief, therefore, China has three transitions to make. From an export-led economy, it has to find its way to a consumer society, in which the bulk of its output is consumed internally. For this to occur, salaries have to rise and the propensity to consume – rather than save – also has to rise. Rising salaries are a natural consequence of skill shortages, but the state has also been encouraging the development of collective bargaining. This has the potential to go very badly wrong, with labour activism running out of control in a world that does not favour China's economy. For China to save less, its citizens need to be confident that they will safe in old age. Savings have been held in state banks, which offer very poor returns. Virtually the sole alternative was investment in property, which fuelled a building boom that was driven even further by state spending during the worst of the world downturn. It remains to be seen if this bubble will have a major impact in China. However, the state, recognising these issues, has begun to offer state pensions with the aim of extending these and other social benefits as widely as possible. The record on these has been both impressive and alarming: large numbers are enrolled, but the management of the system at local level has led to embezzlement on a huge scale, and the plans are currently defined are not sustainable without very considerable state contributions. China is about to undergo a profound demographic change, as sweeping as anything in continental Europe, and failures would be socially catastrophic. The second transition is concerned with political institutions. The nation is ruled by the Party and for the goals of the Party. Ordinary citizens have no say whatsoever, no meaningful access to legal process and – other than through the "petition" culture – no come-back to corrupt administration or malfeasance. There is a strong hereditary element to Party membership, to access to the best schools and other privileges. Party members are able to accumulate substantial fortunes on the basis of minimal salaries, a fact not unnoticed by the bulk of the population. China has kept tight control over news media and other channels. However, the needs of the modern state – mass literacy, IT integration and messaging, human mobility – all make it impossible to manage opinion completely. Middle class networks have always placed enormous emphasis on being in the know, ahead of or independently from the mass of the population, and these whispering nets are wide spread and very effective at getting information from overseas. China is not likely to become a mass democracy any time during the scenario period, but it will have to move to accommodate the vast amount of knowledge and insight that exists beyond the central institutions of Party and PLA. Consultative government is de facto established in local government, in that local officials, major players in commerce, near or actual gangsters and other local powers discuss and negotiate what is to happen. This gives a local relevance to the orders of central government, but they neither call corruption to order nor much represent the local population. There is, therefore, a major gap in China in respect of the consent of the governed. It is in no sense a "democratic deficit" – polls show that Chinese want selfless, all knowing, innately benevolent dictators to make everything work properly – but it is a gap. If the leadership is felt to have failed, that gap will present two problems: it will be a problem that it exists, and it will present a problem in that there will be no readily acceptable way of bridging it. As China embarks on changing its society into something even more inward looking that hitherto, it runs the risk that the outside world will fail it at an awkward moment. This brings us to the third challenge, which is finding ways to manage its new power, It has been committed to "soft diplomacy", although what that has meant in practice is generally commercial investment in local resources. Its efforts to invest overseas have, for the most part, run into major problems of acceptance in the host countries. It tends to assume that a government to government deal or deal brokered on behalf of a Chinese firm will settle or further uncertainties. This has not proven to be the case with mining in South America, food and energy in Africa. Its efforts to secure dedicated farm land in Africa, for example, may well have been wasted if commodity process do indeed soar, or food become scarce. Africa tends to nationalise what looks exceptionally attractive, as generations of energy companies have found. These are, however, less than crucial issues. Many major economies have commercial interests around the world, and the means to protect them. Powers such as the US and Russia – and to a lesser extent, India – have worked hard not to offend China's aspirations. However, recent events offshore – with Japan, with the Philippines – expose a harsher response when the military themselves are major players in events. Clearly, a thwarted China would be in a psychological position in many ways similar to that of Germany in the 1890-1910 period, aching to find a place in the world and feeling snubbed and blocked by the powers-that-were. Admirable as the diplomacy of the past two decades has been, the potential for sharply worse relations is plainly there. These three issues couple strongly to external economic conditions. A revival of world growth is generally favourable to the planned transition. Inequality will grow further, as China has a significant fraction of the world's poorest people, and the supply-side cost of living will rise faster than the income of this cadre. The middle classes will gain considerably in economic terms, and will achieve more reliable and integrated information networks. Local cronyism will continue broadly unchecked. Only central government will be inclined to the original plan, of generating community values and a consumer society. At the other end of the spectrum, a low growth world will make the government's transitional plan acutely necessary. However, it is not a transition that will occur naturally, and the state will have to push for it through many conduits. A major risk is that collective bargaining and working class awareness will take off, leading to major increases in costs for China. Firms are evidently planning for something along these lines – Foxconn, which employs over a million people, is engaging in heavy automation. 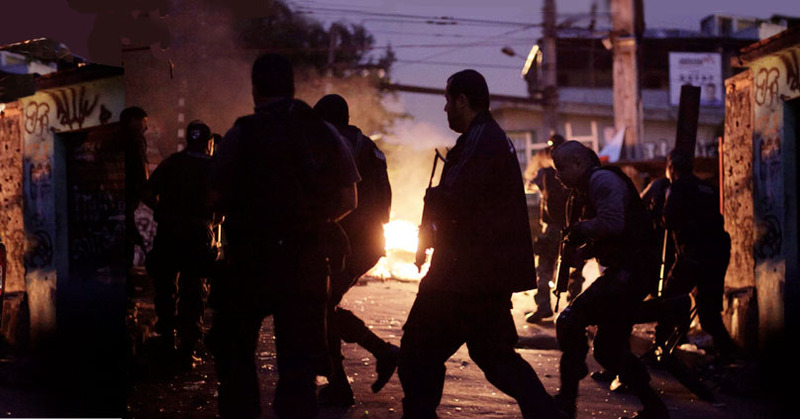 It has been the focus for violent confrontations with workers in recent months. The upshot of militancy and high labour costs would, of course, be capital deepening of this sort, the repatriation of outsourced work to the industrial nations and major layoffs. The division of the working class into those with and without an iron rice bowl could be maintained in the 1980s, under harsh discipline, a sharp rural-urban divide and no real alternatives. It would be much harder to contain in today's social environment. The other emerging market countries have a clear market dynamic, difficult social conditions and cohesion so long as growth continues. When it slows, the results are not catastrophic as these societies are extremely resilient. India and Indonesia are two populous nations that should be excepted from this. Indonesia is very large, relatively well-educated and has excellent potential communications. Why Singapore and not Jakarta became the regional entrepôt is down to political institutions rather than geography. Sumatra has every natural resource that Malaysia enjoys. However, Indonesia still has difficult institutions, onto which is now grafted a strong Islamicist movement. Schooling in whole regions is being deflected away for practical learning to religious instruction. It remains to be seen how this will work itself out. India has shown that small parts of it can grow very fast when regulation is appropriate to need. Its continued limitation is political weakness – including widespread and pervasive corruption – and the sprawling bureaucratic systems that control, contain but do not enable or deliver. Large tracts of the country are rural, extremely poor and without access to basic facilities. Its infrastructure is often somewhere between weak and nonexistent. Corruption is endemic to all aspects of life, often concealed as solidarity with family, caste and other allegiances. That said, India is naturally entrepreneurial in a way that China is not. It is naturally democratic, and tolerant of diversity and the foibles of other groups. Its population are wedded to the notion of self-improvement through education, and extraordinary progress has been made, albeit from a very low base. India and China have a natural economic reciprocity. China can supply much that India lacks – capital, technology – and India is able to marshal a disciplined, trained workforce to meet China's needs as its costs rise. Once again, the realisation of this potential depends both on internal will and external events. 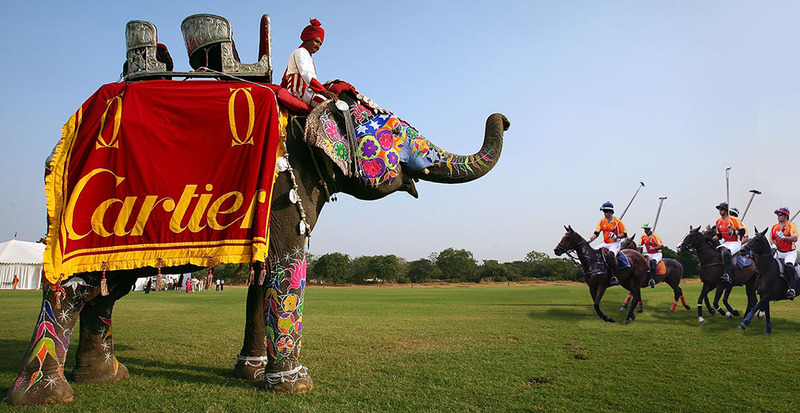 India has a nuclear armed, brittle Pakistan on its frontier. It is extremely vulnerable to energy price rises, to world food prices and to climatic risk. A group of nations have become wealthy – in some cases, vastly wealthy - by virtue of the minerals on which they happen to sit. For the most part, foreign organisation and a foreign work force were responsible for this wealth, and the local elite was able to extract significant returns before nationalising the entire system. Their societies have since struggled to come to terms with this. In the case of the middle eastern oil producers, this has generated centralised states that have a tendency to suppress dissent, and to promote a religious and social orthodoxy which is not universally accepted. Social tensions then express themselves through class, ethnicity and religious sect, things that often tend to run in parallel. We have written a great deal on Islamicism. There is a sense in which this is a force that, if not weakening, is set to seek practical rather than doctrinaire outcomes. One key driver to Islamicism is the sense that even given all of the resources that it now has, the Arab world falls further and further behind other societies. Fundamentalism held that this was due to insufficient orthodoxy. That notion has run its course, and the newer tone is how to learn from the more successful nations, whilst retaining the social traditions and religious beliefs of Islam. If this prevails, it has to be a healthy development for these societies. The recent turmoil around the Mediterranean has led to mixed outcomes, not incompatible with the above view. However, a transition in the Gulf sates – and in the non-Arab gulf – is a much more formidable matter. Rising energy prices, and increased external power intervention in order to freeze the status quo, may allow these fortresses to retain their walls. Whether his matters politically and economically to the outside world, it will have a major effect on what happens to the Arab community. The notion of a Caliphate, dispensing energy in drops to a prostrate world is not, however, a realistic fear. It is little noticed that Africa, for example, is currently growing at unprecedented rates. Having been amongst the richest of the developing nations in the immediate post-colonial period – in aggregate, ten to fifteen times the income per capita of Asia – Africa has suffered stead real terms decline until a few years ago. At least a part of this turn-around comes from a new generation of politicians who do not feel entitled to an easy life after the struggle of decolonisation, who realise that wealth has to be made, not seized and who see success in collective and not individual terms. African nations still struggle at the bottom of Transparency International's corruption index, at bottom of the World Bank's human development index and business friendliness index, at the bottom of the WHO's public health index, FAO's farm productivity ranking and the assorted measures of competitiveness put out by organisation's such as the World Economic Forum. Half of all the people under sixteen years of age live in Africa. Half of the people living in extreme poverty live in Africa. Much more than half the sufferers of the diseases of poverty are found in Africa. Turning this around is a formidable task. As we have seen from the "politics of anger" work that we have done, misery and poverty are not of themselves the cause of trouble; but taken together with external organising agencies, they most certainly can deliver it. Africa – and other poor regions - are a the source of many strategic minerals, such as phosphate, cobalt and so forth. China's short-lived embargo on rare earth elements caused a major crisis in the relevant industries. Whether poor and militarily feeble nations can organise themselves into a cartel is disputable. That chronic chaos and corruption can prevent the proper exploitation of these resources is, however, a certainty. It would be good to think that these nations offered the potential for the longer term, as source of labour and dynamism in a world grown old. However, realism suggests that for the scenario period at least they are largely irrelevant, except as a source of potential problems. 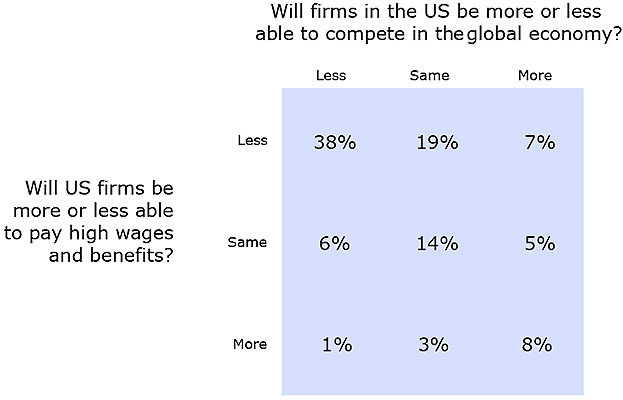 Individual regions feel very different consequences from a low growth and modest growth world. Superimposed on this, there are local responses to these pressures. The New Narrative is a different way of thinking about how life should be organised in the rich world, faced as it is with painful new realities. This issue is sufficiently complex that we have split it out as a separate paper. In broad terms, the New Narrative takes a realistic perspective on the problems of low skill unemployment, welfare and the enormous complexity that we shall all face in the years ahead. Neither Left nor Right, it is concerned with systems performance and how things can best be made to work. It recognises a role for the state, but not the paternalist, statist entity into which the Old Narrative has gradually changed. By contrast to this, the "Old Narrative 2.0" refers to a revival of statism, whereby the national goal is to put things back the way that they used to be – to restore the 1990s, perhaps. In the absence of commercial expansion, this comes down to intense redistribution, job protection and trade protectionism. As the probable impact of this on competitiveness, long term growth potential and business initiative will be highly negative, this is a self-reinforcing spiral of doom. The syndrome is likely to occur when social pressure erupt into active rejection of the integrationist program of the current elite. It is in the interest of these to adopt a populist response, to show that they are hearing the cries of social pain, and to outflank independent populist politicians who are, to say the least, uncommitted to the "European project". The implications of this model to the rest of the world is significant. Europe is a major trading partner. The US version of Old Narrative 2.0 contends with better demographics and less debt than Europe, and so has a freer hand. It is more likely to assist specific industries that have high employment potential, such as construction, and to launch into infrastructure projects. It is likely to tax more heavily and more progressively than in the recent past. That said, it does not grapple with the many issues that we have already discussed. At least two additional cases may emerge from this. One is the effect of growing labour activism in China – and perhaps elsewhere - which may or may not give the Old Left in the industrial world renewed traction. If Chinese jobs are lost to India or Indonesia, then this will not, of course, happen. If industrial world commerce has pressed its efficiency forward so that it can repatriate jobs, then the jobs may either disappear - automated out of existence – or be repatriated. The first situation tends to drive us towards Old Narrative 2.0, the second is one of the symptoms of the New Narrative. The second case is an upward surprise from the industrial world vis a vis the New Narrative. An example from the 1990s would be the just-in-time, quality control, outsourcing revolution. An energy break through of the magnitude of fracking would also do the job. The biological revolution might translate itself into one or more must-have applications. Any such surprise would almost certainly a supply side phenomenon, as the social issues that we have discussed are unlikely to resolve themselves suddenly, certainly within period to 2025. One can, of course, easily think of other shocks that far from improbable in the period, from sudden intense climate change to a political crisis in the Arabian Gulf, from pandemic to further trouble in the world's financial system. These can be thought of a free standing events, however, with the potential to shape everything else, to be sure, but peripheral to the mainstream of organic change. Scenarios are best understood in the context of the key dimensions that underpin them. This gives a space of two dimensions, across which history moved and the future will move. The figure provides these dimensions, and shows the flow of recent history across it. The vertical axis points to good – near potential – economic growth, or a falling below potential. The horizontal axis considers political style of the key players, what we have called the narrative. On the right, we find aggressive, autarchic, nationalist-populist rhetoric and behaviour. One the right, more collaborative, plural, systems-oriented modes of interaction. 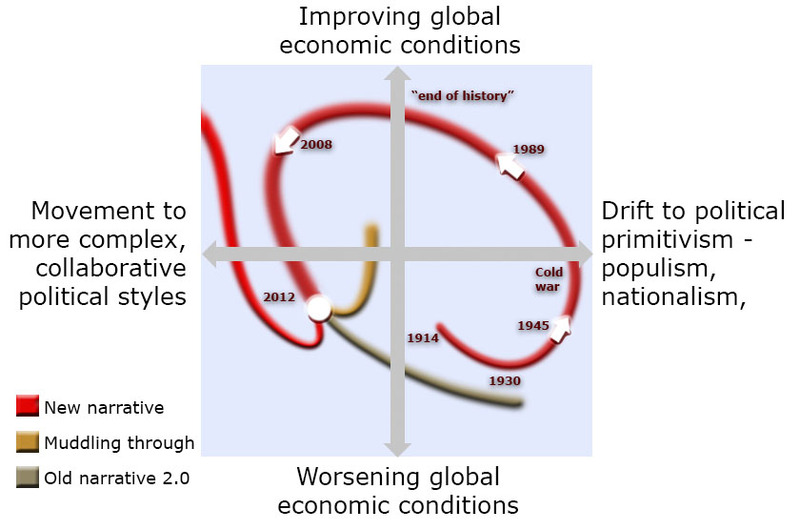 The reddish curve follows the world – in grossly simplified form, of course – from the onset of the first World War through the Great depression, World War II, the Cold War and then the "end of history", the period in which everything seems to go right for the industrial powers. The curve encounters 2008 like a bee meeting a window pane. At issue is: where next? 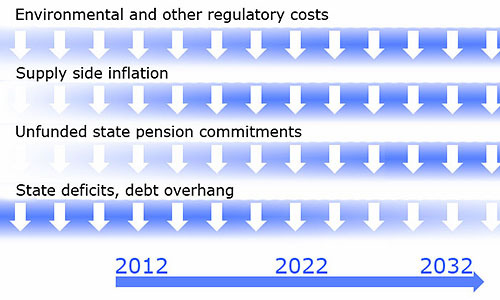 We show three curves emerging from 2012. These are the scenarios. Before developing these further, we need to recap. At the heart of the scenarios is how the formerly wealthy world will adapt to change, and the blood within that heart, social attitudes. It cannot continue with its former model unless rescued by extraordinary circumstances. That will not prevent it from trying, however, and one case involves the denial of the need to change, and the progressive intensification of protection. Demographics does not permit this to be more than a transient reality, however. The third option, the New Narrative, consists of a change in attitude and values that casts off the Old Narrative, resists the appeals of the Version 2.0 and instead throws itself into a positive outlook. 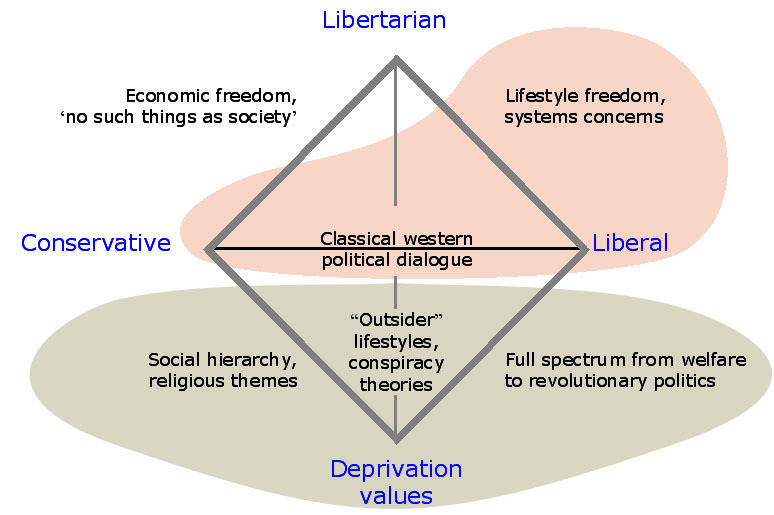 Below, we reproduce the figure found here – an analysis of US politics extended to include Libertarianism – with two areas shaded onto it. The reddish zone is the locale of the New Narrative. The brownish zone, that of the Old Narrative 2.0, which has, of course, the potential to lick up onto the Conservative axis. The area that concludes that "there is no such thing as society" is excluded from both, and is nonviable in the years ahead. One should notice that the New Narrative includes both the former Conservative and Liberal frameworks, but mixes them with issues of systems management and structural excellence in delivery. It holds with some economic freedom, but tends to see commerce as an ecology, in which the health of the whole is more important than the liberties of individual companies. It is happy for a thousand experiments to fail for one to succeed. It actively supports the churning and recycling of assets that comes from competition and competitiveness. It does not forget, however, that all of this is possible if the overall system functions, if excellent people are delivered by the education system. It wants organisations to fit into every niche and every possibility, embraces diversity but manages toxic trends that threaten the whole. Its approach to systems management is based not on detailed management but on general goals and principles, and it is supported by law that allows breached to be sanctioned for their failure to fit with these overall aims, and not primarily for detailed failure to comply with the minutiae of regulation. The scenarios navigate this terrain. The choices made hugely effect economic growth, but to some extent also follow it. 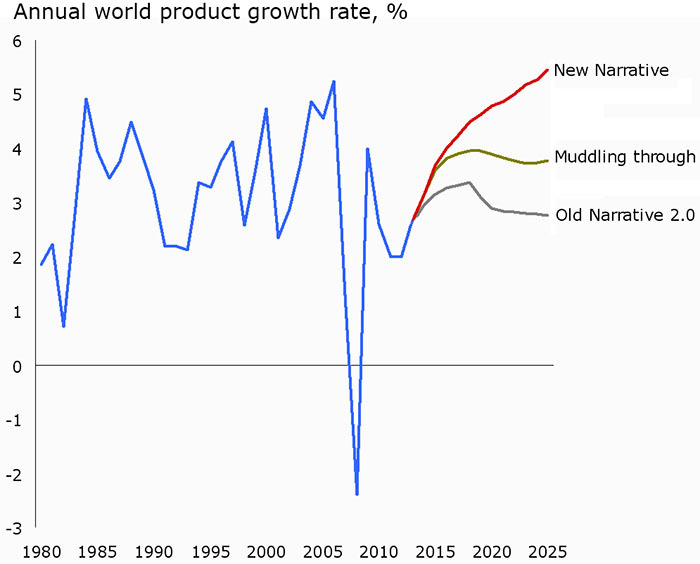 Slow recovery – a low growth world. Let us begin by thinking about a low growth world, in which the purging of state deficits – let alone debt – takes a even longer time than expected. Commerce is uncertain about the overall outlook, either in respect of demand or the possibility of new propagating shocks, with the Eurozone as the primary potential source of these. Investment is slow. This knocks onto the rest of the world, which naturally starts to trade with its peers and to try to stimulate internal demand. This, of course, fits with China's plan to move from an export to a consumption orientation. However, investment in infrastructure is naturally lower than in the past, and terms of trade for primary product exporters are poor. Energy prices remain much as they are today, further weakening net importers. Population growth continues, however, and the youth of the demographically young nations comes of age, consuming and looking for work. In the absence of prior investment, food and other prices begin to creep up. Energy supplies move closer to net energy demand, and the potential for supply-side inflation is established globally. Life in poor countries, and notably in Sub-Saharan Africa, has many pressures and few bright spots. In the industrial world, the political end game around the Old Narrative is being played out. As he have already discussed, a fixed or contracting proportion of GNP goes to welfare, and an increasing proportion of that has to be redirected to pensions, acute needs and productive ends such as education and public health. Responses to this vary, of course, with some nations that are in a relatively good position taking pragmatic steps and those in current difficulties tending to avoid these. One has to imagine all of these trends intensifying as we move towards 2015-17. Any of a number of crises could tip the balance to frank Old Narrative rhetoric in the more vulnerable nations. Some nations move there quite quickly, with unemployment and the decline of state support are the chief drivers. Greece, for example, is extremely close to this situation in 2012. The industrial world sits on a fulcrum, easily tipped one way of the other by events. Let us set this pot to boil gently. The figure which is shown below was posted as a comment, reflecting the futures open to China. 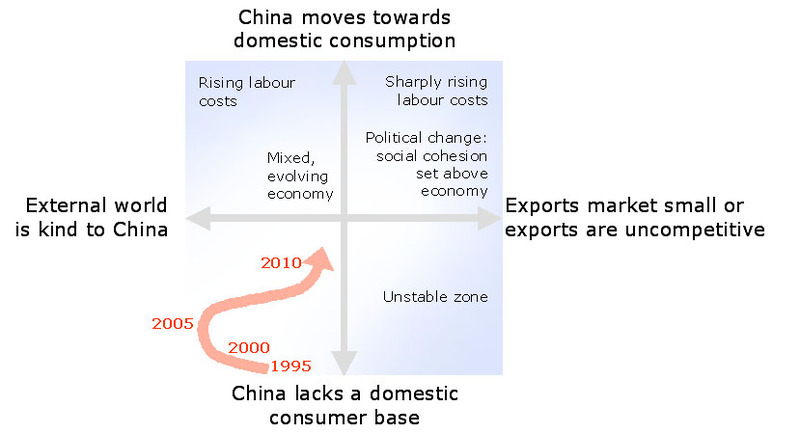 In the upper right – the zone in which internal demand is stimulated, and the external world is unhelpful to China – unionisation runs out of control, wages soar and China is no longer able to take in the rest of the World's manufacturing. Naturally, other nations will quickly take up the opportunity that this presents, much as China itself took up the mantle of Korea, Taiwan and what were then known as the Little Tigers. India and Indonesia are two countries that would benefit from this. Nevertheless, these events are extremely influential, and the industrial world begins to talk of repatriating jobs, and there is a certain triumphalism at China's expense. Some jobs will indeed be repatriated, welcomed by politicians and greatly supporting Old Narrative programs. The popular ear ignores the occasional Cassandra who predicts that this is a temporary situation and that it cannot last. 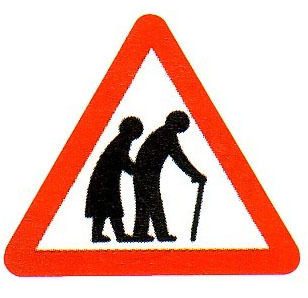 Meanwhile, the former surplus of low skilled individuals is being absorbed both by direct ageing and by the need to care for and support the elderly. Sharp limitations of foreign workers reflect the generally autarchic tone of industrial world politics. Apologist for the Old Narrative see the world put to rights. Politics is set to steam full ahead into the pensions crisis. We will discuss this case in more detail in a moment. However, we left the industrial nations on a slow boil. In the case that we have just discussed, the rise in (some) foreign wages gives a temporary reprieve, and a period of apparent solution to their problems. However, it is likely that China will not suffer this set-back. The slow boil begins to heat up. We have called this second case the "Old Narrative 2.0", following the use of that term earlier in this text. It is driven by a significant fraction of society that feels itself marginalized, and which blames foreigners, the rich and other groups for their situation. A great fog of propaganda develops that obscures rational debate. Nations which tip over this threshold elect populists, people who promise to set the close back to the days of plentiful welfare. Domestic policy is to tax more and, in particular, to tax the relatively wealthy. Trade is also limited "to protect jobs", although declining currencies make exports attractive. Trading partners are not amused, and retaliate. International borrowing is quickly impossible for these nations, and indeed many renege on their foreign debt. Insofar as they cannot borrow money, they tend to print it. Despite a trade surplus, the resulting inflation leads to currency depreciation. Markets quickly become intensely aware of the early symptoms of these tendencies and ramp up borrowing costs - and erode currencies – if they perceive them. The flight of capital and enterprise seals the fate of these nations. The dynamic of the Old Narrative 2.0 leads to discontinuous change, as a string of unstable situations explode like fire crackers. On the figure which shows the scenario trajectories, we have extended the brown line down into the zone previously occupied by the 1930s. However, the 1930s did not have looming environmental, energy, food and demographic crises with which to contend. It did not have nuclear armed, highly unstable states. It did not have an ideological presumption that what mattered was economic distribution: cake slicing rather than cake baking. Often clad in environmental green, a significant thread of debate deprecates growth itself, welcomes a quiet life in the slow lane and snipes at technology, science and commercial success imported from elsewhere. Let us return to out simmering pot, with its lid kept on by a mixture of bad luck for Asia and slightly better growth. In this case, extreme sentiments will exist but they will be repressed by the usual mechanisms. Great efforts go into social healing, continuing with the Old Narrative. We have given the name "Muddling Through" to this, the twilight of the Old Narrative. It does not know where it is going, and has a pretty clear notion that it cannot continue in this way indefinitely. The pensions cliff still looms. Muddling Through is supported by slightly weaker competition, somewhat better innate economic growth, slightly less acute ageing - as medicine allows more to work for longer, and live in a less costly way to the state - innately better growth and slower supply-side inflation. Nations which follow this narrative undergo a genteel relative decline. Parts of their economies are still highly active and of world class. They have considerable military power. They operate, however, with the commercial brakes firmly on, with their economic surplus spent largely on consumption, with savings at rock bottom and with returns on investment weak. Their currencies depreciate and, of course, they have a looming or actual pensions crisis to address. Emerging markets find Muddling Through their period of coming of age. The Western model is clearly spent, and they are free to invent their own world view. This is a narrative constructed by the successful middle classes, pleased by the successful, by tranquillity, by consumption; patronising of the domestic poor and of poor nations; vaguely environmental only when it does not affect them. China consolidates its internal market and tends to shut off the rest of world that does not directly affect it. A specifically Asian trading sphere develops. The oil and gas exporting Middle East settles into prosperous middle age, crushing its more excitable elements. Its governments remains far from secularised, and the societies rest on a quiet foundation of accepted religious dictates. Its rulers understand that good governance around these fundamentals allows for a great deal of practical interpretation, and that service delivery ranks far above notions of democracy. Energy prices are high, stable investment programs ensure adequate capacity and increasing set by a small coterie of powers. Gas is, however, a largely globalized business in which genuine spot markets now exist. This also tends to equilibrate energy prices. This gives us a pair of cases. At least in their early stages, many countries will be a bit of both before international polarisation arises in Old Narrative 2.0. Some nations will then follow one course and others will go down a different route. However, the prevailing narrative will be a strongly conservative longing for "the way it used to be", and a quashing of individualist or liberal interpretations. The poor nations can very easily be distracted by Old Narrative 2.0, with its resonances with oppressed peoples and colonial history. However, the conditions that it provokes are extremely difficult for them. Muddling Through offers both an environment to succeed and – looking to emerging economies - a model to follow. Partnership with emerging economy countries becomes important for both parties, attempting to manage rising labour costs. A faster recovery – a world in renewal. The intrinsic potential of the world economy has been hidden from view since 2008. Many problems remain, but confidence seeps back into the business community. Europe sorts out the Eurozone issues, chiefly by undoing the unrealistic associations that brought them about. A properly managed divorce allows a core of the European advanced economies to maintain the Euro, and the problematic economies revert to other forms in order to allow devaluation, the re-establishment of their competitiveness. The core pools increasing amounts of sovereignty in order to manage a common economy. Global growth is, however, limited in two primary ways. First, innate supply side inflation has existed for some time around energy, food, minerals and other primary products. The regulatory burdens associated with environmental issues, in particular, will trim a percent of economic performance in compliant countries. It simply costs more to get things done. Second, the debt issue does not vanish with the resumption of growth. The Western nations will be paying interest on their debt, and perhaps reducing some of it. This will swallow another point or so off potential growth. Additionally, international competition was always going to be intense, but now it occurs at a given advanced industry five to ten years earlier than it would have occurred in a world that had avoided the 2008 crash. The premium in such a world is to do more with less, and to do things which other people cannot, through finesse, access to better insight or understanding. It demands that the state creates conditions that are suitable for these things to happen. It places great stress on understanding how things work – such as complex systems, economies and enterprises – and on working with and not against their inner dynamics. It supports science and technology as the fount from which much of the finesse flows, and tries to bridge the gulf between general insight and marketable product. It recognises and encourages elite knowledge, the intangible infrastructure that gives rise to entrepreneurialism and innovation It is, therefore, intensely systems-friendly, at the expense of special interests. Welcome to the New Narrative. The New Narrative spreads by example. When the Thatcher-Reagan alignment started to talk about the efficiency of markets and the damage done by statism, they were not initially understood. Indeed, it appears that they themselves did not entirely understand what they were preaching. Some of the things which they did worked and others did not, and a Darwinian selection filtered out the success stories and set them running elsewhere. Privatisation is an example, which spread across the world in a thirty year period. It had completely unanticipated results: telecoms privatisation did not need to have enabled the Internet boom a decade or so later, but nothing about the state monopolies would have permitted this development. Yet the state also played a role, as did other industries, themselves blasted out of comfortable oligopoly by technical, social and industrial events. There are a few nations which are running components of the New Narrative today: Singapore, Canada, Denmark. No nation has, however, cracked the issue of how to be a middle aged, wealthy nation whilst keeping welfare within bounds. There is always a moral imperative, an appeal to 'basic decency' to push it a little further, and then a lot further. As we have seen, this cannot continue and a different approach has to be found. Nobody, to date, has it: certainly not Denmark, with its huge tax burden and universal welfare. When someone develops solutions, however, the world is not short of mechanisms to propagate them, or motives to do so. Benchmarking in government is identifying mechanisms for doing common tasks better, and formalising these at a considerable pace: health purchasing, energy regulation, traffic management and so forth. The problem is that implementation of dull, technocratic things can be implemented by public servants, but bigger picture issues require the involvement of politicians. There are exceptions, of course, but politicians tend to focus on the burning pan and not on the stove. As noted in the separate paper on the New Narrative, the policy process is a mess. New Narrative nations will go looking for new ideas about systems performance – economic, social, environmental, energy, health, geriatric care systems. It will appear first in closed managerial domains and last in the public arena. However, by 2025, it will be the only way to survive as an industrial country. It is also capable of transforming a middle income nation. As an example, imagine that you were running a North African middle income country. Europe has a colossal problem of support in old age, and energy supply problem, a concern about the massive migration that will be needed to look after the old. It will tax heavily. So, you take in Europe's problem, and help to solve it. First, you establish a deserved reputation for probity, stability and openness; in reality and by spending money on this. You invite foreign capital to be a part of the solution to Europe's problem. By way of airlines and airports, construction and exceptional broad band, education and tax breaks for specialists, you provide the ideal place to retire. Families are screen or a short flight way; support is a third of the cost in Europe, retirees pay less tax and everyone wins. To achieve this, the nation needs to think that this is desirable and work towards it for a decade. If this seems unlikely, consider that Spain has about 3 million foreign retirees living in it. The Greece islands had similar numbers before the crisis blew up. Property bubbles are capable of changing the physical landscape of a country in a few years, and planned development is scarcely slower. The figure shows world economic growth, with history running from 1980. The three scenarios have very different rates of growth, with volatility of course much less than history. If we could foresee the fine details we would not be doing this exercise, as our fortunes would be made. The figures are, of course, exemplary and not definitive. They show the consequences of the assumptions that are built into the scenarios. 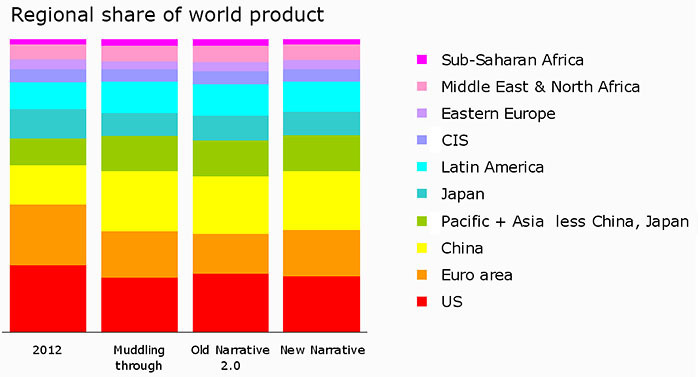 The sharp dip in Old Narrative 2.0 represents the abrupt slip into protectionism and awkward international relations. The final years of the New Narrative case may seem to point unrealistically upward, but this results from Asia and Latin America achieving Chinese rates of growth, as the following tables shows. Different regions will of course grow at different rates. 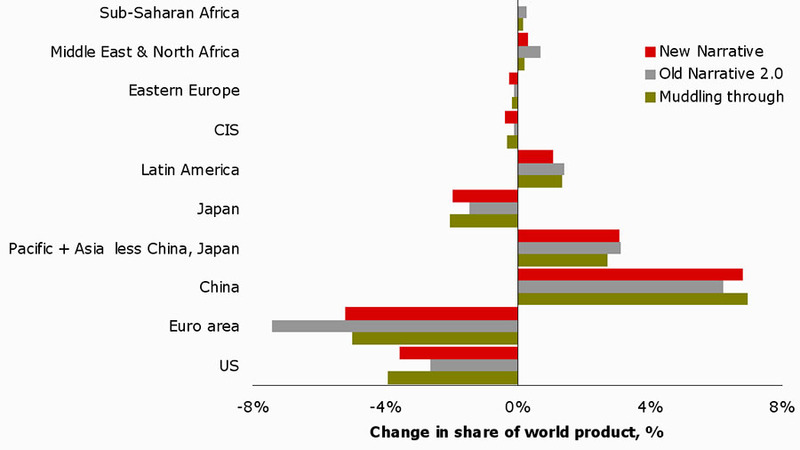 The share of each country and region in the world product of 2025 is shown in the figure. The key finding is the inexorable growth of the Asian region – excepting Japan, which shrinks, and the expansion of Latin America. The European share contracts in every case evaluated. This is perhaps easier to see these changes in the following figure, which looks at how the share of a given region changes as a percentage of its share in 2012. Europe contracts very greatly, the US somewhat and, as noted, Asia and other regions expand. We conclude that even with a reversion to growth – indeed, to very high growth at the end of the period - the centres of economic weight in the world are set to alter. The core economic centres will be urban, often in emerging economies and differentiated between massive, low cost commodity producers and complex webs of idea managers who contract with the producing centres to have things constructed or implemented. The Muddling Through case is perhaps the least disruptive – save to those regions undergoing intense unionisation and wage inflation – and it delivers a world that has similar balances of power to today. However, the wealthy world faces a demographic wall with scant resources, and a set of attitudes which will not be helpful to adaptation. Enough has already been said about the Old Narrative 2.0 world which, coupled to the figures shown above, tell a story of regression and stress.